So, as we all know, Hugo Chávez died yesterday. Now, despite the hidden right-wing-leftist-anarcho-monarchist subtexts I include in all my posts, we're not really a political blog, so we'll just say that Chavez' legacy is, at very best, checkered. 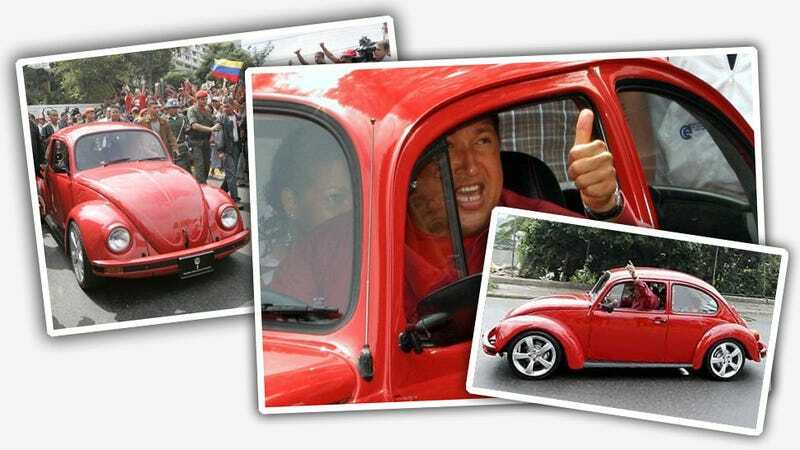 So, despite whatever reservations I may have about the man and his long tenure as Venezuela's Grande Queso, I do have to donate props to the man for one thing: as far as I know, he was the one of the only recent world leaders to drive a VW Beetle. His Beetle, from these pictures, appears to be a Mexican-built late 90s- early 2000s model. Those rims look pretty aftermarket, but the car seems quite well maintained. Still, all is not lost. See, even with Chávez gone, it seems there is still one world leader left who drives an original-style VW Beetle: current president of Uruguay, José Mujica. Often called the "world's poorest president," Mujica drives what looks to be an alliterative-friendly blue Brazilian-built Beetle, which appears to be from before the 1993 restart of old Beetle production in Brazil. José Mujica also donates 90% of his salary to poor people and small entrepreneurs, so it looks like the Beetle-owning fraternity of world leaders is doing much better with the current membership after all. I mean, right? This Mujica guy seems much better. Don't you just want to hug him? I need to see if I can get him here for an interview so we can talk about old Volkswagens. If anyone can think of a world leader with a similarly humble personal car, let me know down there in the comments; maybe we can get them all together for what may be one of the weirdest car shows ever.